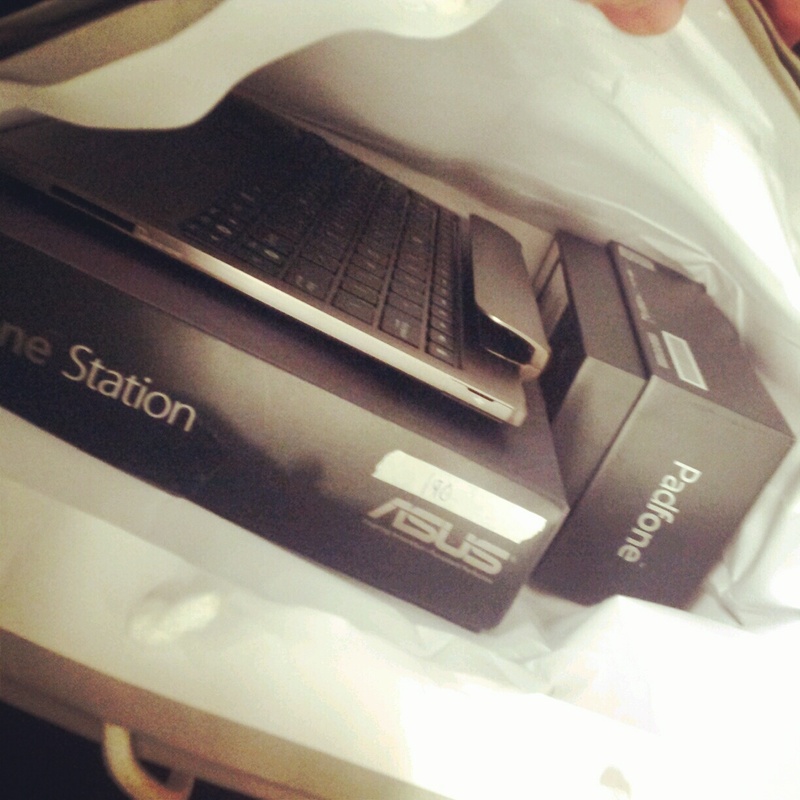 24 hours ago, I received the complete review package from ASUS consisting of the Padfone (A66), the Padfone Station and the Keyboard Dock. It’s finally in my hands after almost a year of wait. So obviously I can’t wait any longer to share with you my first impressions within a day. It Is Responsive. It Is Fast. Padfone is the third Android smartphone I’ve tried that runs on Ice Cream Sandwich (ICS) OS, after Galaxy Nexus and HTC One X. It feels responsive, the homescreen swipes around fast, switching between apps is fast. I am surprised that despite running on Snapdragon S4 dual-core 1.5GHz, the Quadrant benchmark score of 5076 surpasses the HTC One X 1.5GHz quad-core processor, and blazes past Galaxy Tab 7.7 running on dual-core 1.4GHz. I know the Quadrant tests may not be a true indicator of performance, but still, it’s a good feeling to see such high score coming from a modest Padfone. I do notice sometimes the Padfone got “stuck”, probably due to some background tasks. For instance, it took a long while loading the call history when I assessed. But when I tried again later, it feels normal. Once I dock the Padfone to the Tablet Station, it took less than 5 seconds to start up the Tablet. The Tablet homescreen displays an entirely different set of icons and widgets from the Padfone. I do not feel any unusual lag under Tablet mode. It just behaves like any normal tablet, in fact, you might be mistaken as a normal Asus Transformer Pad. Once the Padfone is removed from the Station, the Padfone instantly resumes to phone mode. However, if your app is on display, there is a high chance that it will be force-closed because it does not support dynamic display switch. Just go back to homescreen before ejecting the Padfone and it will be fine. Dock the Padfone Station to the Keyboard Dock and you get a complete laptop solution just like the Transformer. For insights on the Transformer + Dock setup, refer to my Asus Transformer review. The camera is probably the most disappointing feature of the product. While the quality of the 8mp f/2.2 camera is slightly above average, the camera suffers slow focus, slight shutter lag, and inconsistent auto white balance. The front camera is out of focus and there is no AF option. The ICS camera effects list are absent. I will be holding on to the review units for 2 weeks. Join my facebook page at http://facebook.com/musicphotolife , add me at my twitter feed at http://twitter.com/musicdiary . Leave comments below and I’ll try to answer if I can. 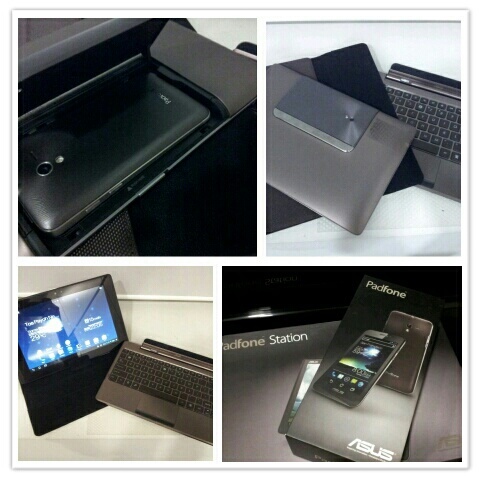 My complete Asus Padfone review is available here. Thanks for doing this review; these are the first comments I have found anywhere from someone who has actually used the Padfone. It doesn't sound like there are any showstoppers for me. It's a bit disappointing the camera can't be as good as the one on the HTC One X. Does it do simultaneous photo and video like the One X? I think that's an ICS feature. Hopefully makers of the best apps will be persuaded to support Padfone screen switching. I'm guessing important stuff like GMail and the browser support this. I'd imagine that some apps just use ICS layout APIs and that ICS would handle any resizing. How widespread is the problem? Seems like there is a workaround anyway – go to the home screen. But presumably apps just restart, and a use case is: I started typing on the phone but decided I am going to type a lot and it would be easier to continue with the full keyboard. Not having to restart the app mid-sentence would be useful. – How much built-in storage do you have on the phone? I heard there are 16GB, 32GB and 64GB models. – Is there a MicroSD card slot on the phone? – There are USB slots and an SD card slot on the keyboard. How does the phone handle this? Can you plug in a mouse? – What's it like physically? Does it feel solid and metal or flimsy and plasticky? – Is the tablet too heavy? Well balanced? That's enough for now. I can probably think of more questions. 🙂 Thanks again for this review. I'm looking forward to trying this device for myself. 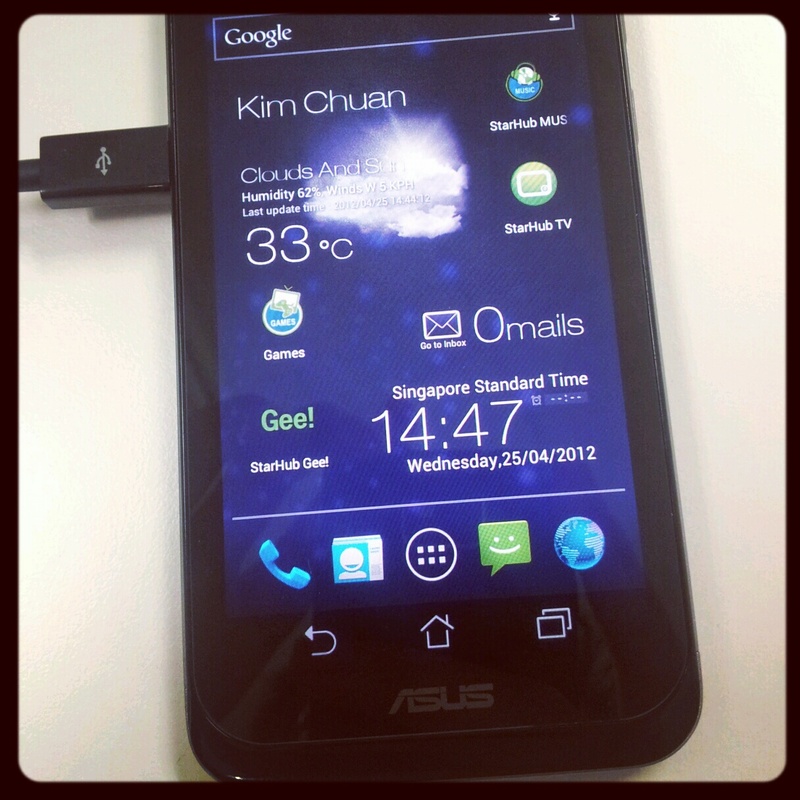 – Is the device depending on the Asus launcher(s?) or can you install two different 3rd party launchers, e.g. GO Launcher EX for phone and GO Launcher HD for tablet mode (both free at Google Play)? – Could you please run the full GLBenchmark 2.1.4 (free) in both phone and tablet mode and give us the complete results? – When you install a tablet only app like Tablified Market HD Lite (free), what happens in phone mode? Is the app hidden? What if you select it from recent apps list? 1. The review unit comes with 8GB memory. 2. There is a MicroSD card slot. 3. The keyboard dock USB slots and SD cards are treated as storage. Refer to my Asus Transformer review for the details. You can plug in a mouse. 4. The tablet and keyboard dock has a consistent matt plastic finish. 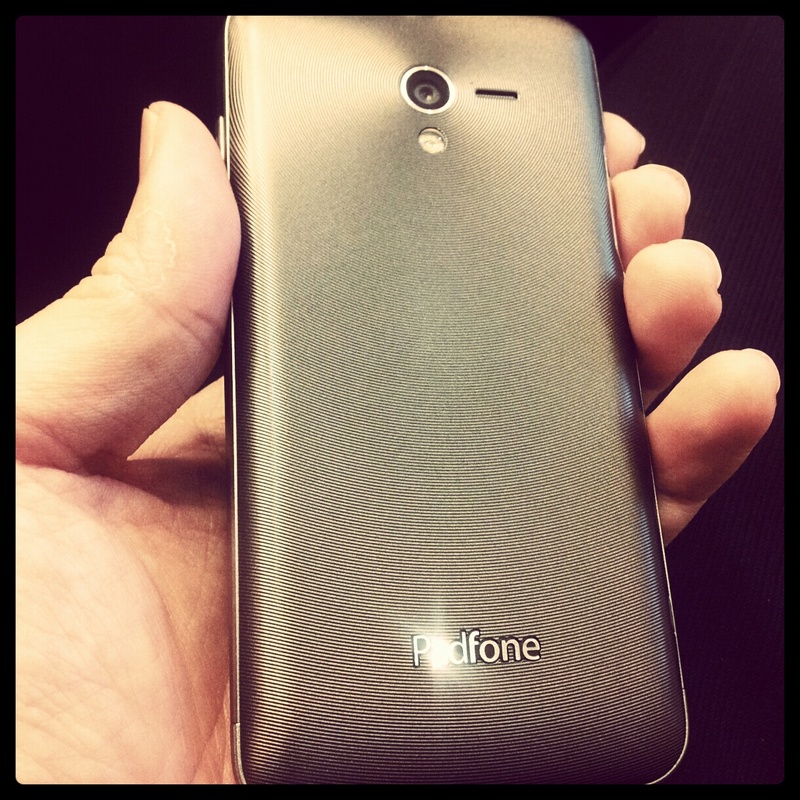 The Padfone feels solid, ringed with metal finish and plastic back cover. The hardware buttons are slightly protruding, which I like as I can press the buttons easier. 5. The tablet feels heavy but solid. The keyboard dock is built to lock after an angle to prevent the tablet from over-tilting and from flipping over. 6. The device depends on Asus launcher. When you use third party launchers, they are considered as apps and therefore everytime you switch from phone to tablet, the "dynamic display" error will appear and then the stock launcher will be loaded. When you try to run the HD launcher on the phone, it will warn you to use the other EX launcher and point you to the Google Play store. If you run the EX launcher on the tablet, it will run. 8. Tablet-only apps might crash on the phone mode. Refer to my facebook page for the error message. Even if you categorise the phone as "Pad Only" in the apps drawer, it doesn't stop you from running it. The feature is only for you to categorise the apps. Oh that's too bad with the launchers. I hope Asus eventually comes up with a Dynamic Display SDK or maybe just a few design guidelines will suffice. – Could you please run the benchmark in tablet mode as well? The point I was trying to investigate was the impact of the resolution on Adreno 225 when every other factor is 100% identical. – When docked to the keyboard and pushed open as far as possible, is the angle narrower than it was on the original Transformer or Prime? – The phone doesn't seem to have a notification LED. Did Asus include any kind of software trick to compensate for this or do you have to light up the screen to check for missed calls etc.? – Is the internal memory unified like on Galaxy Nexus? You can find out in Settings -> Storage -> internal storage. Does the device report a total space of (as you said) 8GB there right on top? and how about the SAMOLED that Padfone had? is it pentile? just from a regular daily use would be fine. and about the sound chip, is it any good like galaxy tab's wolfson chip? and as I plan to use it mainly on the tablet mode, with weight like that, do you think its too heavy to hold? I'm gonna use it mainly as a tablet, with such weight, did you feel it's too heavy? especially for messaging, or any kind of typing? how bout the TFT display? compared to SAMOLED+ or SLCD 2 or IPS+? how bout the sound chip? is it any good like galaxy tab's wolfson chip? I've added the GLBenchmark and Storage screenshots on my facebook page again. The angle of tilt on the keyboard dock is probably a little less than the Transformers, because of the additional weight on the top of the Tablet to hold the phone. There is no LED on the phone, just like Samsung Galaxy S/S2. Asus does not have any software to support on-screen notification. With the Padfone + Station combined weight of 853g, this is the heaviest Android tablet. The bulge to house the phone is actually just nice to grip and hold with your hand, but it'll be weighty for 2-hand typing. I find myself typing text much slower than when I'm using the phone. The only advantage of the tablet is large screen and shared apps and storage. I like how I can use the phone, download stuff or take pictures, then I can insert the phone to the Station and access the downloaded stuff and photos on the large screen. No need to sync among devices or rely on Cloud. Or I can Whatsapp on the phone, then continue the convo on the tablet. I can choose whether I want to use the same app on the phone or on the tablet. I wouldn't recommended you to buy this primarily for tablet use unless you really like the idea of dual-usage. You are better off buying a dedicated tablet which is cheaper, then maybe buy a low-end Android phone. The TFT screen on the Tablet looks no different when I reviewed the Transformer TF101. It looks good on my eyes, and I don't intend to go pixel-peeping. I have seen worse screens but the Padfone and Tablet Station is above average. Sound-wise, no comments since it's subjective to individual taste. The Padfone speaker is unimpressive, but the Tablet Station speaker is powerful and clear, probably on par with the Transformer Prime. Thanks for answering all my questions. Seems like a typical early adopter product: good features but slightly clunky in some areas, like the weight and the way not all apps support switching displays. Doesn't sound like these problems are causing you too much pain, though. CNET Asia complained that some background services (like WhatsApp) closed when switching between pad and phone, so notifications stopped. If true, hopefully that's a fixable bug. 2nd generation padfone? for real? where did you get the informstion from? Would you be able to download the voodoo report app and send a copy of the report to the default email as well as david522@gmail.com ? This should enlighten us as to what audio chip is in the phone. Would greatly appreciate this, cheers. Hi there, I just posted similar question on your FB. 1. Have you tried the stylus? Is the tablet surface capacitive with pressure sensor, which can be used for graphic design or some sort like that ? 2. Does it come with graphic apps for basic painting or something ? 3.How does the stylus behave as phone pieces? Does it come with built-in battery? If it does, how long can it be used continuously without charging? How does it charge anyway? And how is the sound quality of the stylus device? I noticed hardly anyone comment on this innovative way of answering a tablet phone. Pingback: ASUS Padfone Review: User Experience – Music.Photo.Life.